Local access and features charges for each line are billed one month in advance. Both access and feature charges are prorated for the actual number of days with active service. For instance, if your service has only been active for 10 days, you are billed the prorated amount (based on 10 days) plus one full month in advance. You are responsible for all long distance calls billed to your account, regardless of who placed the call. It is your responsibility to read your bill and verify accuracy. 1. Date bill is sent. 2. Date bill is due. 3. Total amount due for charges on this statement (includes any prior unpaid balances). 5. Summarizes the account activity for all recurring services and long distance calls (if applicable) for all accounts billed to this number, including total payments, regulated fees and applicable taxes. 6. Our website and customer service phone number(s). - If a customer subscribes to the Auto Pay Plan, a messeage will appear in the area below the amount due field. 8. Send your payment to this address. 9. This area is for messages regarding your service, promotions and special product information. 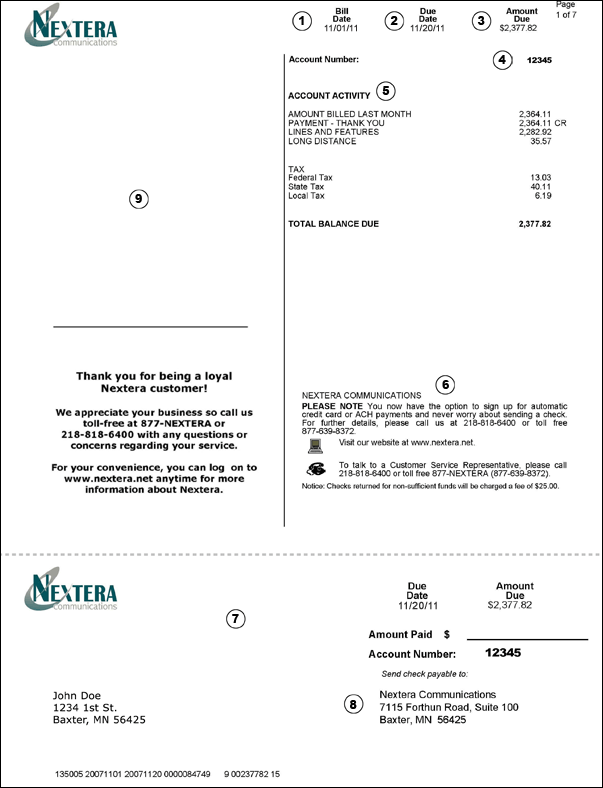 Nextera accepts payment with cash, check or credit card (Visa, MasterCard, American Express, & Discover). Please click here to make a payment via your MyNextera Account. If you have not already logged into your account it will prompt you to do so first, before displaying the payment page. Note: You can receive your invoice via email! Contact Customer Service at 218-818-6400 or toll free 877-639-8372 to learn more.